Have you ever searched the mall high and low for that one perfect store which carries clothes for tall women? If so, more than likely your search came up empty-handed. You left feeling frustrated and angry for the hours wasted and thinking that you're just going to have to live with wearing dreaded high-waters and showing belly forever. What's a tall woman to do? Relax and take a breather! There are more stores selling tall women's clothing than you think. And they can all be found online, from the comfort of your home. If you're unfamiliar with shopping online, don't worry. It really is super easy. Plus, each of these stores have a return policy if you ever need to send something back and try again. Now, let's get down to business. What you have in front of you is a directory of all the stores I've found so far which carry clothes for tall women. Either search the list by the following categories or through the full, alphabetical listing provided. I'm sure that you'll be amazed with all the options! List of Tall Specialty Stores – The stores on this list specialize in and offer nothing but tall women's clothing. They focus exclusively on extra long jeans and pants as well as tops specifically proportioned for the above-average body type. At these stores, if tall is what you want, tall is only what you're going to get. List of Stores Carrying Tall Sizes – The stores on this list sell clothes for those not blessed with our height, but do also happen to carry a variety of clothes in women's tall sizes. Some have a specific tall section on their site. For others, you may have to do a little more digging to find those longer inseams and taller sizes, but know that they are there waiting to be found. List of Designer Stores Carrying Tall Jeans and Pants – The stores on this list carry designer clothing. But, you ask, don't designers cater to the average body type only? Not all of them! Some designers make long length jeans and pants, and the stores where they are sold can be found here. List of International Stores – Why stick to only the U.S. when you can also go overseas? 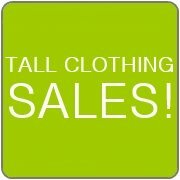 The stores on this list offer clothes for tall women from abroad. Try out a different culture and check these out for something new. List of Custom Clothing Stores – So, you've searched and tried on and still can't find anything that fits you just right? Don't give up hope yet. You still have one more option...custom clothing. The stores on this list will cater to your every want and need. It can't get any more perfect than this.